Iran's President Hassan Rouhani calls for "year of unity"
Iran's President Hassan Rouhani called for a "year of unity" as Iran celebrated 39 years, since the Islamic revolution today, in the wake of protests last month. 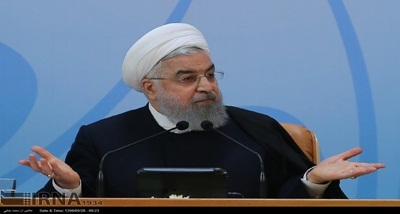 Rouhani said conservatives should not block reformist candidates from future elections and that there should be greater trust in the people of the Islamic republic. Rouhani requested in a speech before a huge crowd in Tehran that the 40th year of the revolution, the coming year, be the year of unity. He asked conservatives, reformists, moderates and all parties and all people to come and be together. Rouhani, a long-time regime insider who won power in 2013 and again in 2017, with the backing of reformists, has faced tough criticism from conservatives over his efforts to rebuild relations with the West and ease civil liberties. The conservative-dominated Guardian Council has the power to veto candidates in all elections, and has in the past barred hundreds of reformists from standing for the presidency and parliament.